Lucy Green Bakewell lived for a few years in Crich, probably in the Mansion House according to the recollections of of Miss Mary Brown recorded in New York during 1902 when she was aged eighty-seven. Lucy emigrated with her family to America where she married John James Audubon in 1808. Her husband went on to become of the worlds best illustrator of birds. Audubon’s great masterpiece was The Birds of America, published in London by R. Havell & Son, 1827-1838. This four-volume elephant folio set achieved Audubon’s goal that the birds should be shown life size, in action and in appropriate settings. The Birds of America was a popular and lucrative success, earning Audubon a place among the great American artists of the nineteenth century. There is hardly a library in any stately home in England which does not have a copy of Audubon's work. A little farther on the street, and on the same side, is a house fronting on the street, with walks and shrubs on two sides. That was Mr. Saxton's house, and a building in the rear had been fixed with outside steps for a schoolroom, and an elder Miss Saxton taught for many years. That house had been the house of Mr Bakewell's family (our Mrs Audeben's parents). Miss Lucy Bakewell was about six years older than my mother, but she and her sisters were intimate with the family. 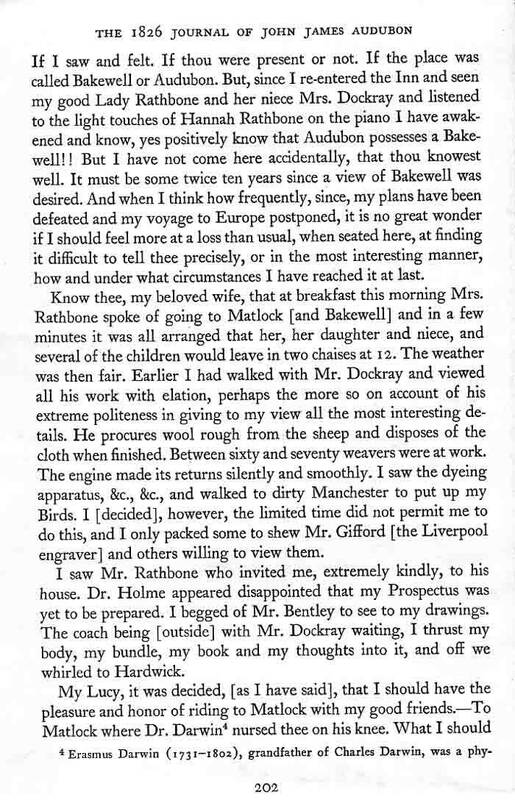 Mr Bakewell's removal to America was a cause of grief to my mother and her sister, and Miss Lucy wrote letters to my mother for some years afterwards. 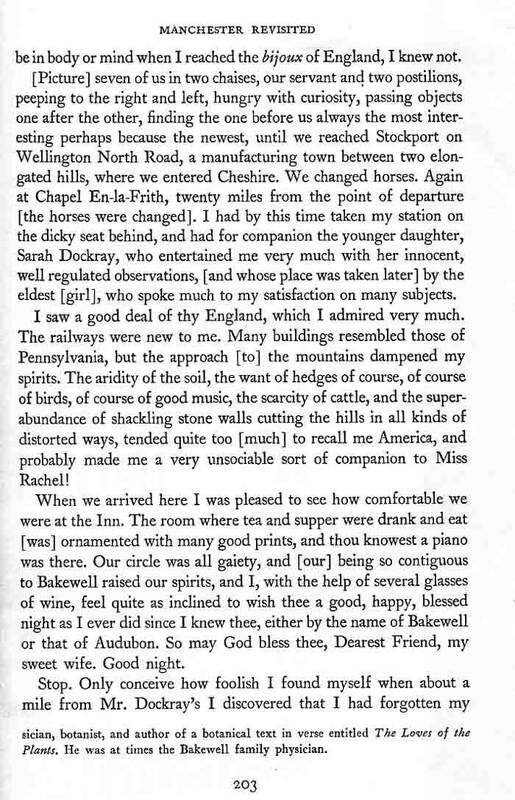 When I was in my teens, living at Hollins, I often read these letters, written in New Jersey thirty years before. They seemed a sort of romantic story, and now I think Mrs. Lucy Audeben's whole life was a romantic story. Pity these letters were lost when we left England. I wish you could take a picture of that home of Miss Lucy Bakewell. A brief history of Lucy entitled "Lucy Audubon née Bakewell: from a Derbyshire childhood at Crich" has been written by George Wiggleworth, who has given his permission for it to be included on this site. The 1826 John James Audubon, wrote an account of his journey to England and Scotland to arrange the publication of "The Birds of America." 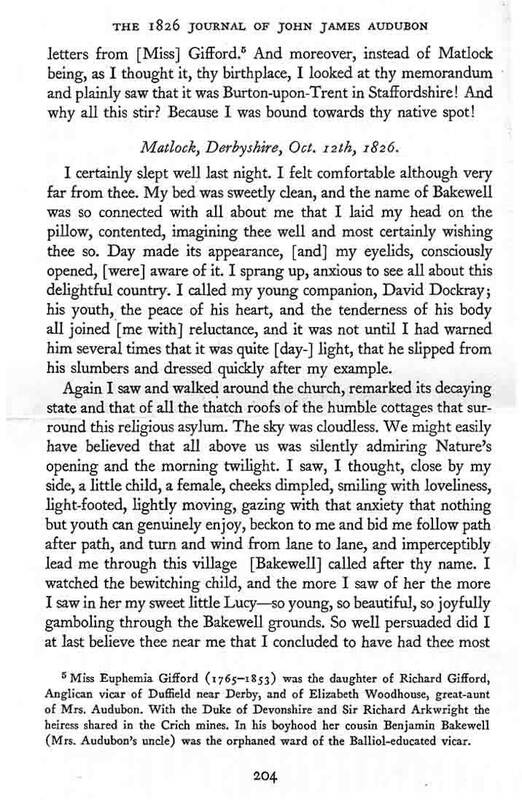 In part of the journal he writes about his time at Bakewell (his wife's namesake) and Matlock. Interestingly he recounts that it was in Matlock that Dr Charles Darwin bounced Lucy Bakewell on his knee. The funeral of the late Mrs. John James Audubon took place yesterday morning from the Church of the Intercession, One-hundred-and-fifty-eighth-st. and Eleventh-ave. The altar, reading-desk, and family pew of the Audubons were heavily draped in mourning, and the burial service of the Protestant Episcopal Church was read by the Rev. Mr. Peters of St. Michael's Church and the Rev. Dr. Abercrombie of New Jersey. The pall-bearers were G. B: Grinnell, J. A. Haven, E. De Peyster, Dr. Bodenstein, B. W. Van Yoorhis, Sheppard Knapp, jr., W. Burgoyne, and W. Duxley. 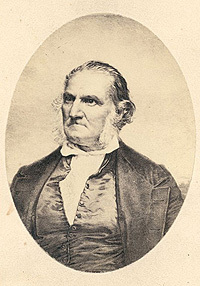 A volunteer choir, under the leadership of Alfred Witmore, sang the hymn, "Asleep in Jesus," and "I know that my Redeemer liveth" was also rendered. Among those present were Messrs. Victor and John Audubon, sons of the deceased. Mrs, Levi Stockwell, George B. Grinnell, John Tournelle, Judge Newhaven, Wellington Clapp, Sheppard Knapp, jr., Martin Brock, and others. The floral tributes were numerous, and of all designs, the family of the deceased sending a bouquet of roses in a sheaf of corn. The remains of Mrs. Audubon arrived in New York on Monday, in charge of her grandchild. The body was left in the hearse in the church-yard, but a catafalque was raised in the center aisle of the church and covered with a pall and the floral tributes. After the services the body was interred in the family vault in Trinity Cemetery, where the remains of her husband were left in 1851. The vault is on the south side of the cemetery, and near the Hudson River, but no tombstone or inscription marks the place where the great naturalist was buried. 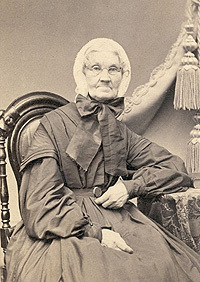 Mrs. Lucy Audubon died at the advanced age of 88 years at the residence of her sister-in-law, Mrs. William G. Bakewell, in Shelbyville, Ky. She was born in England and came to America with her father when not more than 12 years of age. In all the vicissitudes of her husband's life she was a patient and faithful sharer. With the publication of Audubon's great work, " The Birds of America " in 1828 fortune began to return. After several voyages to Europe, where they were received with great honors, they returned to America and settled finally, in 1833, on the Hudson. Here Audubon died, leaving his wife in the possession of the homestead, which was sold soon after his death for about $60,000. This property is in the neighborhood of One-hundred-and-fifty-sixth-st. and now known as Audubon Park.